Tim Mullooly: Welcome back to Living With Money, this is Tim Mullooly. On today’s episode I am joined by Sam Reyes. 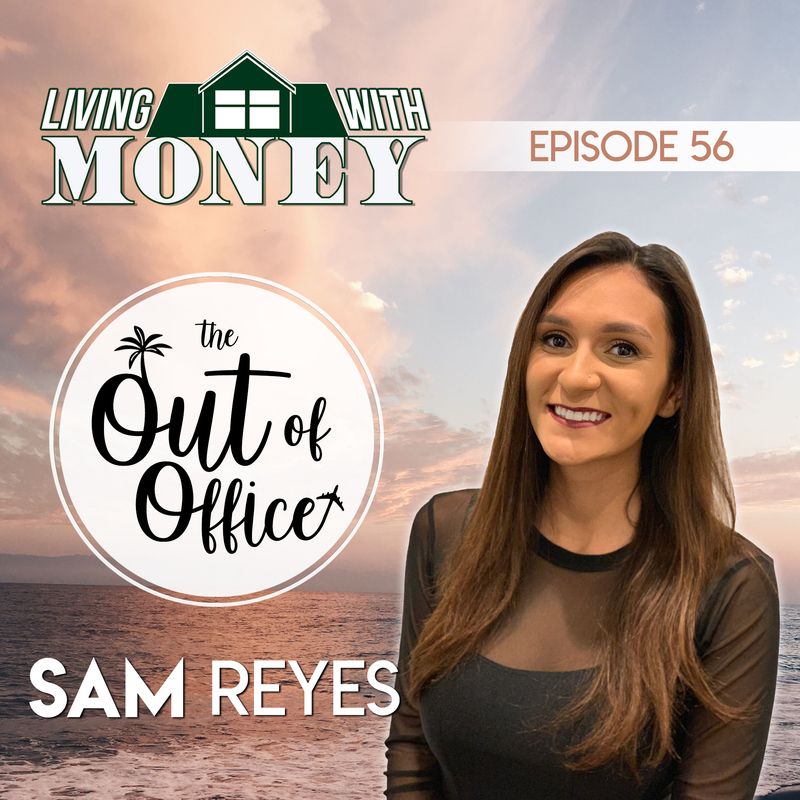 Sam is the creator of the Out of Office blog where she outlines different tricks and tips for traveling the world while also managing to keep her full time career. Sam, thanks for coming on the show. Sam Reyes: Thanks for having me. Tim Mullooly: Before we dive into your travels and different tips and whatnot, do you want to just tell the listeners just a quick background about yourself and how you got to where you are in life today? Sam Reyes: Sure. I was born and raised in Westchester, New York, about 45 minutes of the city. Both of my parents are actually first generation immigrants, they literally grew up in the projects and they grew up in New York city their whole lives and brought me into the world and then moved to Westchester. Ever since I was younger I kind of knew that I always wanted to be in media and wanted to be in communication so that’s what I kind of focus on. High school, went to college, studied mass communications, did a bunch of unpaid and paid internships and now I am a multi-platform strategist for Comedy Central. Tim Mullooly: Alongside developing your career, when did you kind of first realized that you had that travel bug, so to speak, or when did you know that seeing the world was something that you wanted to do as much as possible? Sam Reyes: Honestly, I’d never actually left the country until I was in my junior year of college. Both my parents have been working class so we never able to really travel that much or go on vacations out of the country. It wasn’t until college that I did a science trip to Costa Rica and I thought that that was really cool. Honestly, it was really after I graduated college I kind of was in this phase of my life where I had a really great job and I had really great friends, but I was still very frustrated with where I was. Obviously, me and you we went to college in Pennsylvania, so I had a lot of friends in Philly and I had friends in Baltimore who were able to graduate college and then get their own apartments, kind of start their own lives, but because I lived in New York and my job I was able to get a job right after college in New York City. The rent was crazy expensive there, minimum of $1,500 for a nice apartment. Tim Mullooly: Not really manageable for someone right out of school. Sam Reyes: Exactly. Again, like I said, both my parents were working class so I had a lot of student loans. They were never able to help me. I was seeing all my friends kind of living their lives and I was frustrated because I was living with my parents and even though I had a great job I wasn’t able to really live in the way that I kind of thought that I always would be. Tim Mullooly: Right, be able to branch out. Sam Reyes: Exactly. I was young, I was 22. I wanted to be an adult and have control of my life and I felt I was in this position where my student loans were over $900 a month, so I couldn’t move out while doing that. I had to all of my own bills because I was never rich. I was frustrated and it kind of just hit me one day where I’m living at home, why not take advantage of this? I started kind of making a list of goals that I wanted. This was what? It was literally 2017. Stereotypical, I literally made a list for 2017 of my goals and I just wrote a bunch of goals. I wanted to go to one new place every month, was one of them. I wanted to volunteer. I wanted to go somewhere by myself. As soon as 27 I started really kind of looking into it and as soon as January started I just started looking into things to do and actually my first trip that I went on was with my friend Jen. We went to Florida and it was a four day weekend and we went to Florida, Savannah, St Augustine, and then we took a trip to Devil’s Den and it was the first time that I actually had gone on a trip just so sporadically. It kind of gave me that boost of confidence, you know what? I could do this. I booked a trip to, I don’t even know where my next trip even was. I booked my trip to South Africa and I went and it kind of was all downhill from there. Tim Mullooly: For the listeners out there, like Sam mentioned, we went to college together so we’re friends. I follow her on Instagram and everything and like you’re saying, it was just 2017 but it in these last couple of years it seems you’ve done so much traveling and place after place and finding these different places to go to. It’s awesome. Sam Reyes: Honestly, the biggest battle is just that first trip. I think with anything, it’s always kind of the hardest to get to that point and then once you’re there you realize how easy it is. My list of going to one new place a month it really was like go to a new town, go to a new bar and it actually ended up being literally to a new city. Once you go to the first one, it really is so easy because you kind of get into the hang of things. Tim Mullooly: Recently you’ve started the Out of Office blog. What ultimately made you want to just sit down and start writing these blogs? Was it just having so much experience traveling over the last a couple of years or what was it that made you want it to start writing all these things down for everyone to read? From having that and my dad I was like, actually maybe I do kind of know what I’m talking about. People are coming to me, I should help people. I finally actually did it. I think I was more scared that somebody would be like, “Oh, who are you?” But then actually having people come and asking me all these questions, I was able to write them down so people can just go and see what it is that I actually do because I don’t think that I’m doing anything crazy or different. I think that people just don’t know about it. Tim Mullooly: Yeah, I totally agree because from my own personal experience, when I saw that you started the blog, I was like, wow, that’s actually a really good idea because me even when I’m trying to book a trip, sometimes like you said, just doing it the first time or taking that first step it’s like I don’t even know where to start. So like you’re saying, it seems people were asking you questions that were kind of basic to you, but for a lot of people out there it’s how do I even start booking a trip? Sam Reyes: Right, and I was at that point too in my life. Because I was googling flights and I was actively looking, I had come up with my own list of the sites that I go to for flights, the sites that I go to for accommodations, the sites that I go to to find a new place. I knew what it is that I was looking for. I knew that there were other people that were looking for the same thing. I knew that I would be able to give them those sources. Tim Mullooly: Absolutely. I read on the site that you called the Out of Office Blog, it says it’s not just another travel blog. What would you say kind of separates your blog from the different sites out there and the different websites that you read about other people’s travels? Sam Reyes: When people hear travel bonder, this person that spends literally, they wake up in a new country every day and it’s kind of this glamorous lifestyle, but not everybody can live that life. I have a lot of bills, have a lot of obligations so I can’t travel all the time and I don’t think that there really is a source for people who do work. And so I think my blog it’s the Out of Office, but it’s travel resources for the working professional. You don’t have to quit your job and travel and backpack Europe to consider yourself a traveler. You could have a full time job and go visit all the places that you’ve always wanted to. You can have both dreams. I think honestly too everybody wants to be this traveler. Everybody kind of wants to see the world, but some people like their job too. So why would you have to quit your job in order to see the world? You can do both. I think that my blog is really for people to figure out how it is that you can balance both. Tim Mullooly: Yeah. I mean, like you are saying everyone would want to just be a traveler as job title, traveler. That would be great, but reality for most people is more in line with what you’re writing about in your blog how do you balance having a full time job and also traveling. Sam Reyes: And also too I think my website too is more of budget. Yes, I would love to spend a night in Dubai in this luxury hotel, but that’s not going to happen for me. Where else is really nice that I can go there and enjoy. So it’s enjoying your life and kind of living luxuriously I guess on a budget. Tim Mullooly: I think that’s more realistic than a lot of the other things you see out there. We’re going to dive into some of the different blog posts that you’ve put up on the site already. One of the first posts was your cheat sheet where you list out a bunch of different travel websites and resources that you use to find good deals and make your traveling easier. Do you want to talk a little bit about a couple of the different sites that you like to use the most in terms of making your travel easier? Sam Reyes: Yeah. Honestly, I actually have a tab open on my computer right now for TourRadar. I think that that’s probably the best site. What it is is it’s a website where you write pretty much where you want to go. They give you a list of budgeted tours and so for people who are traveling by themselves or want to meet people or are kind of scared to make that first step, I think tours are the best way to do it. Because you can meet somebody and it’s an organized thing for you, so everything’s set up and TourRadar is the best site budget wise. They have everything from guided tours to self-guided tours. So even if you like traveling by yourself and you don’t want a very strict schedule of where to go at what time, they have where you’re going to stay and where you can go and they have buses that up, you’re at your own leisure. You guide yourself from point A to point B. I think TourRadar is great and also Skyscanner I think is another really great resource for flights. It’s a website that essentially you put in, my recent one is I’m trying to get to Egypt. I put New York and then it literally tells me how much it would cost me to go anywhere in the world. You could go there to see how much a flight would be to Egypt and then it actually can break it down for you by the month. They could break it down for you by when it’s the cheapest to go there. It could say if you wanted to just know where the cheapest places to go in March are from New York or from Baltimore, it’ll list that out for you. It also tells you the cheapest flights, like I said, to Egypt. It’ll tell you the airlines and it’s not even really just doing a round trip from JetBlue or a round trip from like Southwest. It’ll say, oh, if you do Spirit this way and then if you do Frontier the other way and this is what the cost would be. It really breaks down everything. Tim Mullooly: That’s awesome. Going back to the first one that you were talking about with TourRadar, I know for me I think, oh, I’d really want to go to this one place, but then it’s what would I actually do there? Then you’re like on your own to kind of fill your itinerary with stuff. Sam Reyes: That was literally my biggest thing because I did a tour to Thailand. Yes, anybody can really book a trip, but in Thailand, where am I going to go? Everybody speaks Thai there. The closest language I can speak is maybe a little bit of Spanish, barely, so I’d be useless. It sets everything up for you and they have guides that speak English and you meet people from all around the world. Tim Mullooly: Yeah, that’s definitely something that I think a lot of people would get a good use out of. For the people listening out there, we’re going to link in the show notes on the website to these different blog posts and also the different any websites that we’re mentioning here as well. For me personally trying to find a cheap flight is the biggest hurdle. Is Skyscanner the one place that you go to for everything or are there different sites that kind of give you different options when trying to find cheap flights? Sam Reyes: There’s a lot of different websites that do a lot of different things. I like to use Skyscanner just because I never really know where I want to go so I literally will go New York March and then I’ll see all of the different places that I could go for cheap. I’m literally just trying to find the cheapest flight anywhere. But there are a lot of other websites like Hopper is one that’s good. Hopper and Airfarewatchdog, they’re two websites and also they’re apps too, so you can do them on your phone. You can say where it is you want to go and they’ll track that flight for you. If they predict that the flight’s going to go down at a certain time, they’ll send you a notification and be like, hey, you should buy this flight maybe in a week or two or they’ll tell you what weekends they think would be the cheapest for that time. There’s also websites like Secret Flight and the Flight Deal that I also highly recommend. They’re more last minute and I mean the last minute by like next month so not really last minute. But they will show you places like, oh, flights coming out of New York or flights coming out of Baltimore, Chicago, main cities and they’ll show you deals that airlines have. A lot of times airlines if they’re don’t have a full flight yet, they’ll go to these sites. They’ll show you, oh it’s for $259 you can get from New York to Prague or oh we’re having this deal to go to Lisbon or Spain. And so it’s good for people who, again, don’t know where they want to go. Tim Mullooly: That’s really cool too. Especially you said about the notifications because that’s one thing that I personally wouldn’t know when is the best time to travel somewhere or the prices always fluctuate with these flights. You never know oh, do I really have to check in everyday to see when these prices are going to drop? Having those notifications must be a pretty useful. Sam Reyes: It’s kind of crazy how all the science behind it because a lot of these websites to search the month that you want to go, you don’t even have to search the month actually. You’ll search whatever flight it is and it’ll show you in a chart when they predict the price will drop, how much they think the price will drop to and it’s pretty accurate. I think a lot of them they work with airlines. Tim Mullooly: One of the biggest excuses I feel for people for not traveling, and I’m guilty of this as well, is just being able to say that they can’t afford it. We touched on it a little bit earlier, but for someone who has a full time career, like you’re saying with everyday bills to pay for life gets expensive enough as it is. How do you afford to travel and how can others kind of work more travel into their lifestyle, into their everyday budget? Sam Reyes: It’s kind of making travel more of a priority really because I know that I love to travel so I really kind of budget my life around that. Right now I’m living in Manhattan and all my friends are here so it’s kind of making the choice of do I want to go out to this expensive dinner or do I want to maybe save 70 bucks so that I can go somewhere. It’s really kind of prioritizing what it is that you actually need to be spending money on versus what you can kind of cut out of your life. I’m a girl so we get our eyebrows done every two weeks. We get our nails done every two weeks. We get expensive haircuts for no reason or decide to get a blow out just for a night out. It’s really deciding I can do all those things myself, I’m just being lazy and so kind of budgeting that. But also having kind of an open mind of how I want to travel. Travel is actually very affordable if you cut out hotels. Staying in hostels there’s obviously kind of the stereotype that hostels are dirty and sketchy and you’re staying with six people that you have no idea, but actually in Europe hostels are actually hotels. You would go in and you’re staying in a hostel but you would have no difference between you being in an hotel and being in a hostel. Knowing that, yes, I could go to Italy and stay in a boutique hotel or I could get there and search for a nicer hostel, enjoy just as much because also why would you be spending, a lot of these hotels are $100, $200 a night and you don’t even plan on being in there for that long. My point is to see the world. Tim Mullooly: You’re not there to stay in that hotel. Sam Reyes: Exactly, why am I going to an all-inclusive resort in Mexico when I want to see the temples? Just kind of having a realistic expectation and having an open mind and choosing budget over luxury. Tim Mullooly: I feel that ties nicely into kind of what we tell our clients here and that stretches over anything, whether you want to buy a house or buy a car or travel, it’s just choosing what actually matters to you. Sometimes that’s a hard conversation for people to have with themselves. Sam Reyes: Yeah, it is. I’m somebody who I experienced FOMO, fear of missing out. I absolutely hate when my friends hang out without me, I hate it. I’m in Thailand having the time of my life and then I’m finding out that all my friends are having a barbecue I’m like, how could they? It’s choosing to save money where you can. I can tell my friend, yeah, we could all go out to dinner or I could just say, hey, how about you just come over we’ll get some snacks and hang out that way. Having it all is worth it, you just have to kind of figure it out yourself. Tim Mullooly: Absolutely. One hurdle is not being able to afford it. We just tackled that one. Another hurdle for some people is finding someone to travel with. I feel like some people might be afraid of traveling alone especially if it’s to kind of a faraway place in other countries something like that. You wrote a post about traveling on your own. Do you want to tell us a little bit about your experiences traveling solo and what you think are some of the pros and cons of doing that? Sam Reyes: Honestly, I think traveling solo is probably the best thing that anybody could do for themselves. It’s one of those things that I think you learn about really who you are and you learn about other people. You learn about other cultures. When you’re traveling by herself you don’t have anybody to tell you what to do or you don’t have, I think a lot of times too, when you’re planning a trip with somebody else especially for somebody like me who I don’t have just one friend, I have a group of friends. Trying to coordinate schedules is probably one of the most frustrating things because I have these two days off, somebody else has to work or somebody has to do whatever. Traveling by yourself it eliminates that whole thing. If I have two days off I can just go and I don’t have to worry about when I have to fly out or where I have to go to. It’s good for that. But you also go to these places and you meet a lot of people. One of my first trips that I did solo, like I said, I volunteered in South Africa. I think that that’s kind of also a good beginner stuff, volunteering for something because you’re going somewhere by yourself but you have something to do there. Oh yeah I could go there but then what am I going to do? Tim Mullooly: You actually have a purpose there. Sam Reyes: Exactly. I went to South Africa. I stayed in their volunteer base. They told us what we were going to do. I woke up every day, we went out sailing on a boat doing a bunch of research and then we came back and then the guides would tell us, “Okay, now you’re free.” We could do this or this or this or that. We could drive you here. These are all the things that you could do. It’s kind of a half day thing. I think also too for people who want to travel by themselves but are kind of scared, tours again are the best thing. You go there by yourself, but you’re also meeting other people who are on that trip by yourself so you’re not actually by herself. Then probably finally I would say staying in hostels I think is very important to this too. I went to Ireland by myself. I chose Ireland because I went to Dublin. I knew it was a city, I knew everybody spoke English so I’d be able to navigate and then I stayed in a hostel. When you stay in hostels, a lot of the hostels too they do walking tours and it’s very much like a community thing because everybody’s there for the same reason. Nobody wants to be in their room. Everybody is from different places, everybody wants to meet each other. They usually have bars there so everybody’s hanging out at the bar and I actually from doing that because South Africa is my first technically solo trip and then Ireland was my first real solo trip. When I was there I met so many Americans to the point where we all decided to go to Thailand together. Literally all the people that I met in Ireland I went to Thailand, we did a tour in Thailand and from that tour is the people that I met from the UK and then I did a trip to the UK where I stayed with them. Traveling by yourself it kind of opens these opportunities. If you were traveling with your friends you’re not really looking to meet people. A lot of us Americans we’re kind of antisocial. You kind of mind your own business, you need to do what you have to do. When you travel by yourself, literally it’s kind of that moment where you’re there and then you’re kind of, now what? Your senses are kind of open to everything. I literally went to Ireland, I got there and I’m like okay, now what am I going to do? And I saw that there was a walking tour. I did that. I went into a restaurants and I would ask the bartender, oh, I’m new here, what places should I go? Where should I eat? You open yourself up to all these opportunities. Tim Mullooly: You don’t to constrain yourself to what other people want to do either. You get to know yourself and you get to what do you actually like to do? Sam Reyes: I think probably the only con I can think of is that same thing of where now you have to come up with what you want to do and sometimes you’re like, I don’t know. Sam Reyes: Yeah, I think for first time solo travelers one of the best things that happened to me was I was in Ireland so everybody spoke English. I think that if I was anywhere else I would have had a mental breakdown and maybe never done it again. But I would just walk, ask people what there was to do and if I saw that there were tours, I would do all of the touristy. It’s a pro because obviously you’re meeting other people, but it is kind of a con because you’re pushing herself and at some point you’re tired and you don’t want to do anything but it’s only 3:00 in the middle of the day. I never felt unsafe ever, so I think that that’s good. But I think that the con is really just getting out of your own head. I’m somebody who I naturally walk with my headphones in, I listen to music everywhere I go. It a challenge for me to kind of be that open minded person and talk to strangers. Tim Mullooly: In terms of safety you, you brought that up. I mean, do you think that doing sometimes the tours and the touristy things reduces the risk of running into safety issues because you’re in places that everyone there is a tourist doing the same thing, right? Sam Reyes: Yeah, I think that does really help. Again, Ireland I did a walking tour and then I actually signed myself up for a tour, a bus tour that took us through Killarney, which is a little county and then to Galway. We were in a bus with a tour guide and a lot of the tour guides, that’s literally their job. Their job is to deal with tourists all day. They teach you a lot of stuff that you wouldn’t normally know. They’ll tell you, hey, over here, don’t walk with your phone in hand. Tim Mullooly: Don’t go here. Sam Reyes: Yeah, or go here, don’t go here or this is fun during the day, as soon as the sun starts setting leave. I think also maybe it’s an American thing, but we also assume that the world is a lot more scary and bad than it actually is. I’ve been to a lot of places by myself and I don’t ever think that I’ve ever felt unsafe. We assume that the worst can happen and yes, of course sometimes it does, but for the most part people are good. If you’re confused you can ask somebody a question and they’ll tell you or these tour guides that’s their job. They want to give you all the information for you to succeed and for you to have fun in their countries so that you can come back. Tim Mullooly: Absolutely. Being able to travel, you want to do it efficiently and that means having some of the right gear ready to go when you book a trip. In terms of luggage and stuff that you bring with you, sometimes you don’t want to be bulky lugging all this stuff around. What do you use when you travel and what do you think are “must haves”? Sam Reyes: It’s funny because I actually get this question a lot and I cannot talk more highly about how important it is to have packing cubes. Packing cubes are life. Tim Mullooly: What our packing cubes? Sam Reyes: Packing cubes are literally what they sound like. They’re just little cubes for you to put your clothes into and they come in different sizes and I think it more started as an organizing thing so that you can put all your shirt somewhere and then put all your pants somewhere, but packing cubes they save your life. You can fit so many more clothes in because it compartmentalizes everything. It makes everything smaller so you could put everything everywhere. I’m somebody who it doesn’t matter where I go, I’m usually never going anywhere more than two weeks, but I literally have only ever traveled with a carry on and a backpack. Having a good backpack is the key to life making sure that you could fit clothes in there and it organizes your stuff, but packing cubes, I have two sets of packing cubes and I fit two weeks’ worth of clothes into my carry on and my backpack anywhere I go. If I’m taking spirit or frontier, I will only bring a backpack because I refused to pay extra for a kilogram and I fit four days’ worth of clothes into a backpack. Everybody get yourself a good packing cube. Tim Mullooly: I mean, obviously from the way it sounds you would vie more towards the side of packing light in terms of packing heavy. Tim Mullooly: You over pack but you still fit everything in just a carry on and a packing cube? Sam Reyes: I cannot stress it enough. I’m the person who when I’m going somewhere, I literally wear the same thing every day. I wear leggings and like a tank top and I circulate through like the same five. But when I’m going on vacation I’m like, oh, but this shirt. I’m like, oh, maybe I’ll wear this sweater. Oh, what if it’s going to rain? I need to bring this rain jacket. I’m thinking about everything. I’m a girl so oh, what if I feel like wearing a skirt this day? What if I feel like wearing a dress? What if it’s cold? I fit every single thing that I ever need with packing cubes. It really is the key to life. That and my portable charger. Packing cubes and a portable charger because I think we are so dependent on our phones and we don’t even think even when you’re going out at night, out with your friends, a portable charger is good. Especially when you’re in a different country. I have apparently to parents that my dad calls me every single day even when I lived at home, he would call me every single day just to see where I was and how my day is. Everybody wants to keep in touch, everybody’s always on Instagram so it’s important to have your phone fully charged. Tim Mullooly: Especially in a foreign country sometimes like if you’re traveling by yourself, you don’t want to be in another country with a dead phone. Sam Reyes: I use mine as a GPS to find places to go, especially in a different country where you maybe don’t even speak the same language. It’s a lot easier to be able to get yourself from point A to point B without having to ask a Chinese woman how to get to your hotel. Tim Mullooly: Definitely you do. Two takeaways from that, portable charger in packing cubes. Thank you for explaining to me what packing cubes are. Sam Reyes: I can’t believe you didn’t know. Literally, I’m telling you it really will change your life. Also it just organizes everything so nicely. Tim Mullooly: I feel like you might get this question a lot and we’ve kind of touched on it a little bit before as well, but how do you keep a full time job and travel as much as you do? What are some important things for people to consider when it comes to balancing work and time off and travel? Sam Reyes: A lot of it is knowing that I’ve now kind of also got to this point in my life where you don’t need to take a week off of work to visit a new city especially if you’re staying in the United States. When I went to Vegas with my friends, you don’t need a week in Vegas. Actually, no, I don’t ever try that. If you’re visiting a new city, you really only really need three or four days. When you have a full time job, I think a lot of people think you need to take a week off or oh I don’t have PTO days. Kind of planning your time off strategically. I’m a very big on taking either Friday off or a Monday off and doing an extended weekend trip. Also doing night flights. I’ll take a Friday off and then I’ll take a flight Friday or Thursday night after work. I get there actually on a Thursday night and then I have all day Friday all day Saturday, all day Sunday or if I know that we have Monday off for like Martin Luther King Day or something, doing a trip then. Because we also have all these random days off kind of planning your trips around there and kind of figuring out where it is that you want to go, the cheapest time to do it and how much time you actually really need. Tim Mullooly: It’s kind of what you were talking about how to afford travel, it’s kind of just budgeting your time off and budgeting your weekends and stuff like that. Sam Reyes: Also because I think we all assume, oh in the Summer vacation, going to all the same places. A lot of times if you’re going somewhere, I think that this is also another big thing that people don’t think about, is going places in their off season. It’s so much cheaper and not going to places that everybody’s going to. Right now everybody’s going to Iceland, that’s the big thing. That’s an expensive trip. I’ll wait a year. I don’t really need to go right now. I’m going to go somewhere that people aren’t necessarily going. Everybody thinks Paris, that’s a very expensive trip. Why don’t you go somewhere else? Tim Mullooly: Just kind of segues nicely into my next question, which was going to be about picking where to travel. Sometimes I feel for people that’s another big obstacle too. The world is huge, you could pick literally anywhere to go and that could kind of hold people up sometimes. How do you pick where you’re going to go next and what’s the thought process there? Sam Reyes: For somebody like me, I want to go everywhere. I don’t really think about it in the sense of, oh, where is it that I want to go? I kind of think more of where’s the cheapest place to go right now? And that’s where I’m going to go because in my head I want to visit the entire world so why not go to places that are less popular? Kind of what I was saying. Currently I’m actually thinking about going to this country called Moldova which is in Europe and it’s actually the least toured country in Europe. Every flight there is just so cheap. Doing something like that, you don’t think to go to Moldova, you think to go to London or Paris. Just from the cheapest, where’s the cheapest flight and also where nobody is going and starting there because that’s probably the best place to start. But I think even just coming up with things. Social media it’s like this stupidest best thing in the world. I follow a lot of travel little things, especially on like Facebook. Unilad or Travel and Leisure and they do a lot of videos. Here’s Turkey and here’s Egypt and here is Kenya and they show you little snippets and even though it has a million likes, a lot of people aren’t going there because a lot of people for their first trip they want to go somewhere like London or Paris kind of thing. I follow a lot of those. I follow a lot of travel bloggers and just kind of go through social media and I kind of also look at places for the type of trip that I want to do. If I want to go hiking or if I want to go to a beach and using social media like Instagram or Pinterest and just searching beautiful beach and honestly, or searching the best hikes. A lot of times too people I don’t think consider traveling the US as traveling but it’s just the same. Going places in the US because it’s the best place. There’s hot springs in Iceland and there’s also hot springs in Utah. People don’t think to go to Utah. Tim Mullooly: Way cheaper. We talked about so many different things in terms of traveling, but if let’s say you’re in an elevator with someone, you have the standard 30 second elevator pitch and someone’s like, what’s one thing that I should know about traveling? What would you tell them? They would tell me about their countries. There was this guy from Denmark that told me that his education and health care there are free and he’s like, “I don’t understand how you guys pay for college.” I’m like, “You guys don’t?” And he’s like, “No.” He’s like, “Because we’re putting our money and our time back into the economy.” He explained it to me and I just was like, “Oh my God, that makes so much. Why am I like deriving student loan debt?” But for anybody it’s just my biggest kind of thing is always just to tell people to just go. Stop getting in your own head, stop coming up with excuses, just go because it’s the best thing that you could do for yourself. Tim Mullooly: Last question I like to ask all the guests that come on here, whether it’s a piece of personal or professional advice, what’s one thing, one piece of advice that you’ve gotten that’s kind of just always stuck with you? Sam Reyes: I was thinking about this too because I’m trying to think about what the most influential thing is that I’ve ever heard and I think that the best advice that I ever got it’s not even really advice and it’s a generic thing, but it’s always stuck with me. My mom, when I was in high school, she would always explain college and my 20s as the time to live your life. She would always be, “Sam, live your life. Your young, be young, live your life.” She would always say that about college, just have fun. And then after college when I started traveling she was saying, “Just live your life.” I think that a lot of the times I kind of just always think that, this is the time for us to do everything that makes us happy. Don’t let little things that set you back. Don’t worry about your siblings or your parents or your friends and what they’re doing. Live your life for you, do what makes you happy. This is us, we’re the only people that are living our own lives. So go out and have fun and not worry about anybody else. Obviously don’t be selfish but now is really the time for us to do all the things that we want to do before it’s too late because we’re in our careers. You’re moving up in your careers, which requires more of your time. You’re starting families and settling down and buying houses and having mortgages. Just live your life and do what it is that you want to do and don’t stop holding yourself back. Tim Mullooly: Absolutely. Couldn’t agree more. Well Sam, that’s all the questions I have for you. Thanks for coming on and talking about your blog and answering some of my questions. Sam Reyes: Thank you for having me. This has been so great. Tim Mullooly: Awesome. So for the listeners out there, again, we’re going to link to the Out of Office blog, all the different blog posts that we talked about today and the different websites and stuff that Sam mentioned throughout the episode. Thanks for listening to this episode of Living with Money and we will see on the next one. If you would like PDF version of this transcript, please follow this link for a download!